Several criticisms of the current fiscal strategy in the EU have recently been forcefully expressed. In this brief, we examine these criticisms, and provide some clarifications and responses. We recall that large adjustments are needed in most economies to restore sustainable fiscal positions, not because of the arbitrary will of the markets or of EU institutions. We then examine the debate over the precise speed of fiscal consolidation, which blends arguments over the short-run growth effects but also over the various possible costs and problems of no-consolidation. In practice, fiscal policy recommendations under the EU framework have struck a balance between the conflicting considerations. I see that Vox has posted a self-justifying piece on fiscal austerity from the European Commission, declaring that the Commission is pursuing a “delicate balance”. Actually, that’s kind of awesome: how does that “delicate balance” feel in countries with 15, 20, 25 percent unemployment? And in general, it’s quite a spectacle to see officials patting themselves on the back over an economic strategy that, let’s not forget, has tipped Europe back into recession, and keeps pushing overall euro area unemployment to new highs. In Germany, the fiscal stance is now broadly neutral, hence consistent with the call for a differentiated fiscal stance according to the budgetary space. Translation: Germany isn’t imposing Greek-level austerity, which proves that we’re flexible! That’s a LOT of fiscal tightening; it would be hard to offset even if the ECB were going all out with quantitative easing, whereas the reality is that it won’t even cut interest rates. Now, much of that tightening comes from countries that have no choice about imposing at least some austerity. But the Commission should be urging those countries not suffering from a debt crisis to be engaged in offsetting expansion — not giving Germany a thumbs up when it has in fact been moving in the wrong direction. I’ve been thinking about how to teach monetary economics from the beginning. Perhaps before people start learning, they need to unlearn things they believe, that just ain’t so. We market monetarists believe that monetary shocks (or “disequilibrium” if you prefer) is the primary cause of business cycles, indeed almost the only cause of big swings in unemployment. Most people don’t believe this; indeed it’s not even clear that most economists believe this. Instead the average person thinks recessions are caused by big real shocks, or financial shocks, of one sort or another. Asset bubbles bursting, 9/11, stock market crashes, devastating natural disasters, etc. 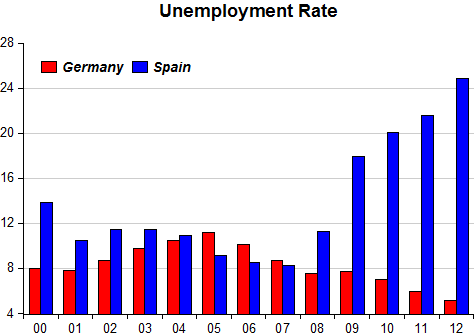 The contrast between Germany and Spain shows that very clearly. Krugman, I think, frames the austerity debate in the wrong way. 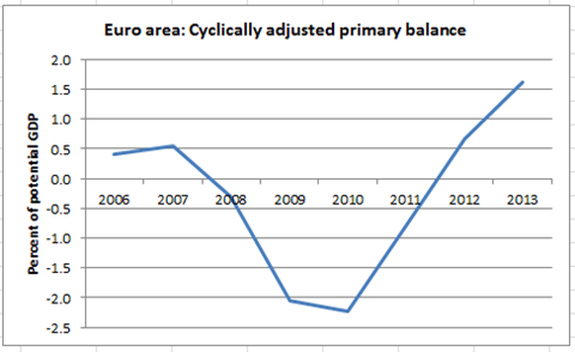 Austerity is only contractionary if the central bank doesn’t offset. Since the ECB isn’t interested in offsetting, austerity is making things worse; but it isn’t austerity itself that is bad, it’s the ECB not level targeting core inflation that is bad. It would be much better to frame the problem as one of trade offs between targeting headline inflation on a quarterly basis and having a financial crisis every other day with a lot of unemployment, or targeting some other nominal variable that lets prices fluctuate to a certain degree and having more stability and people employed. Even a compromise of level targeting the price level would be much better than what’s going on there now. Bonnie, true, but Krugman is a ‘slave’ to his LT view, which stops him from giving more credit to monetary policy. Petar, loses easily to Mike Sax´s “Diary of a Republican Hater”!